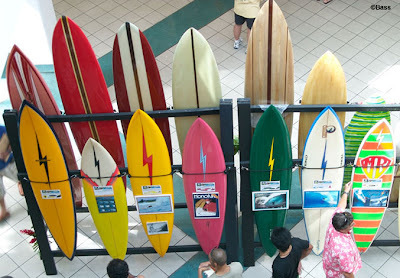 The recent Hawaiian Islands Vintage surf Auction saw record prices including 5 boards that sold in excess of US$20,000. My passion is for Lightning Bolt twin fins like the board second from the left. The good news is our collections are gradually incresing in value. The bad news is the chance of us finding pieces of surf history in garage sales for $15 is getting smaller and smaller. For me the fun part is finding and riding these boards, not owning or selling them. The good news if your willing to hunt around there are still good boards out there at reasonable prices. 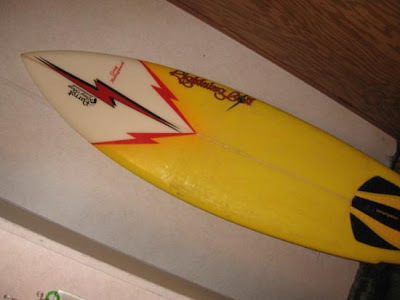 Like this bolt twin fin below that was for sale on Craigslist for $300. 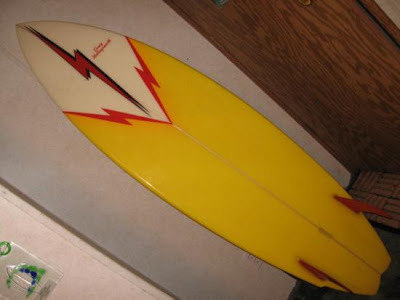 The bad news is people are finding these boards and selling them for up to US$2500 like the bolt twinny below for sale near Dana Point. Now I'm no martyr. I've found boards for $15 at Taree cash converters that i've sold for over $900. I can see that my finds are going to become more and more rare but at least these boards are not ending up as land fill and will live on hopefully to be shared with all of us.